On the road: Johnny will enjoy a few days of rest this week before heading off to Bowling Green, Kentucky, to headline next Saturday's (August 23) Kentucky Blues Festival. Tickets still available! In early September, he'll play a short string of northeast dates, starting at Stearns Square CitiBlock Concert Series in Springfield, Massachusetts on Thursday, September 4. That performance will be followed by two nights at the Bull Run Restaurant in Shirley, Massachusetts (Friday, 9/5 and Saturday 9/6), and the The Turning Point in Piermont, New York (Friday, 9/12). More shows on sale! Johnny will play seven shows in California starting at the end of September, including his headlining stint at the San Francisco Blues Festival on Sunday, September 28. He'll also return to the Narrows Center for the Arts in Fall River, Massachusetts in December. (Click here for ticket information.) And to learn more about this unique, non-profit facility in southeastern Massachusetts, check out this article. For a complete list of Johnny's tour dates, click here. UPDATE: Johnny in Milwaukee on Friday! Friday-night blues: Johnny will hit the Turner Hall Ballroom on Friday night, and you can read a preview right here. 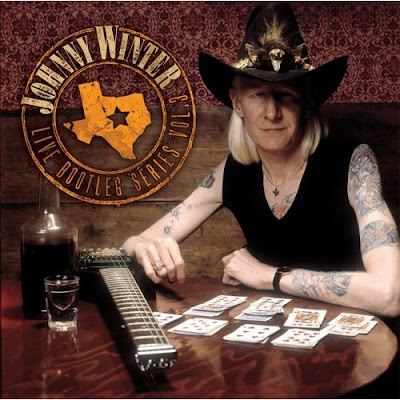 Latest Bootleg hits the streets: Johnny Winter and Friday Music have released another installment of Johnny's archival releases. Live Bootleg Series, Vol. III picks up where the second volume left off, serving up yet another heaping dose of vintage performances personally selected by Johnny himself. Tracks include "Mojo Boogie," "Stranger Blues," "I Smell Trouble,"Boot Hill," "Stones in My Passway," "I'm Gonna Murder My Baby" and "Highway 61 Revisited." Liner notes for the new album were penned by Johnny's friend Andy Aledort, who is the senior editor of Guitar World magazine. On the road: Johnny just returned from a tour of Europe and is now gearing up for a few U.S. dates that will kick off this Wednesday (8/13) at The Cabooze in Minneapolis, Minnesota. Other dates include the Clearwater Theater in West Dundee, Illinois (Thursday, 8/14); and the Turner Hall Ballroom in Milwaukee (Friday, 8/15). On Saturday (8/16), Johnny will headline Ribberfest in Madison, Indiana. He'll then enjoy a few days off before playing the Kentucky Blues Festival in Bowling Green on Saturday, August. 23. For a complete listing of Johnny's current tour dates, click here. Thirty-six years ago this month: Johnny joined the Allman Brothers Band onstage at the Hollywood Bowl in Hollywood, California for a smoking version of "Johnny B. Goode." It's online in all its glory at Wolfgang's Vault, and you can listen here. Some great video: Here's Johnny at the Gibson Summer Jam '08 in Nashville with Slash, Larry Carlton and Paul Nelson. And last month in Italy, the legendary Dickey Betts teamed up with Johnny.